This is such a busy time of year for me every year as i have to make up all the pottery that has been sold this year so that it is there for the craft fair season. To add a little pressure to this schedule I have agreed to be the volounteer first aid chaperone for a school group who is doing the West Coast Trail!! A lot of time management skill is required to prep for the hike: everything from packing and getting needed items to hiking with the whole "kitten-caboodle" on my back! Non-hiker-dave and i have gone out for a walk/hike where he is wearing kakki shorts and a t-shirt and i am wearing everything i own from the huge backpack and boots to gaiters and hiking poles. We will definitely get a photo the next time we are out walking mismatched together and i will post it. 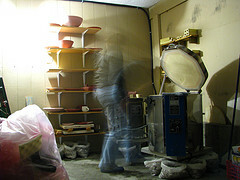 For now, i am off to the studio to unload the warm bisque kiln load and trim the tiny bowls that i made last night. I just booked the Clements Centre for November 26th and 27th for my Solo Show. Details to follow.